This session will provide information from national funding agencies and academic and industry collaborators highlighting the range of on-going engagements. CORK, COUNTY CORK, IRELAND, July 10, 2018 /EINPresswire.com/ -- Photonics Ireland is Ireland's premier photonics research conference and is being held this year at Pairc Ui Chaoimh in Cork. 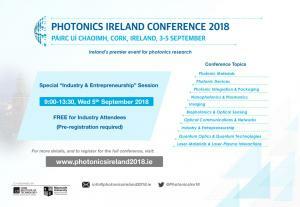 Photonics Ireland is running from 3rd - 5th of September and jointly hosted by The Centre for Advanced Photonics and Process Analysis (CAPPA), Cork Institute of Technology and Maynooth University. This year's conference promises to be one of the most exciting and diverse events yet, with both national and international speakers, the conference will provide insight into the current status of photonics research and the hot topics on the horizon. To highlight the increased collaboration and co-operation between academic and industrial partners the organisers are holding a special industry session at this year's conference covering "Industry and Entrepreneurship". This morning session, free for industry attendees, will provide information from national funding agencies and academic and industry collaborators highlighting the range of on-going engagements. This will take place on Wednesday 5th of September from 09:00 to 13:30. The Centre for Advanced Photonics and Process Analysis (CAPPA) is a research centre of Cork Institute of Technology, conducting both applied and fundamental research on photonics for applications in areas as diverse as telecommunications, medical devices, food and pharmaceutical manufacturing. The centre is co-located both in CIT's Bishopstown campus and in the Tyndall National Institute. CAPPA is at the forefront of photonics research in Ireland. CAPPA works in the area of photonics generation and manipulation of light, and a major strand of CAPPA's activities focuses on bringing the benefits of photonics technology to a diverse range of industry partners. Photonics has been identified as an important enabling technology for a wide range of applications. Photonics has been identified as one of six key enabling technologies underpinning the European Union's Horizon 2020 programme.